This project was so easy that I worked on it up at the Schnarr’s cash register between customers! When I got a new dishwasher this spring, I decided to get rid of my broken garbage disposal rather than purchase a new one. When it was working, I rarely used it anyway since I composted almost anything that would normally go down it. In a way it’s kind of a bad habit because I already have more than enough stuff but I do enjoy saving odds and ends of things I might be able to re-use and seeing if I can make them into something useful. My Dad installed my new dishwasher for me and removed the old garbage disposal and he gave me several ringlike parts that he thought I might be able to use for something. 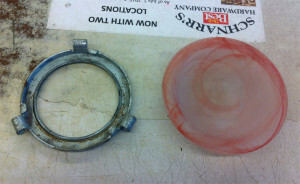 One of them fits perfectly a glass part of a broken fountain/mister that someone else gave me. Ring from garbage disposal and glass dish. The glass bowl-like object rests nicely in the ring, so I decided to make a butterfly feeder out of it. 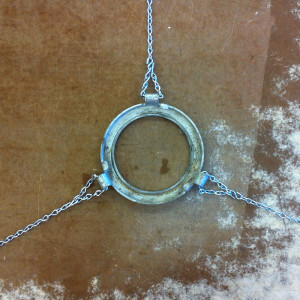 The ring has three rolled tabs protruding around the outside edge. It was an easy matter to thread some chain through these tabs to suspend the feeder. From Schnarr’s I purchased some chain of a suitable guage and some small s-hooks to link the chain pieces together. First I made three short equal lengths of chain. I pulled chain links apart with pliers to separate. Next I threaded the small chain pieces through the rolled tabs to make loops, securing each with a small s-hook that I pinched closed. 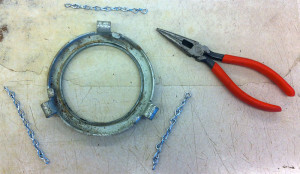 Connecting chain pieces to ring tabs with s-hooks. Next I cut three equal longer lengths of chain and secured them to each small loop by pinching closed the other end of each s-hook. Then I gathered the three chain lengths together and the top and secured them with another s-hook which can be used to suspend the feeder from a beam, tree branch or stand. 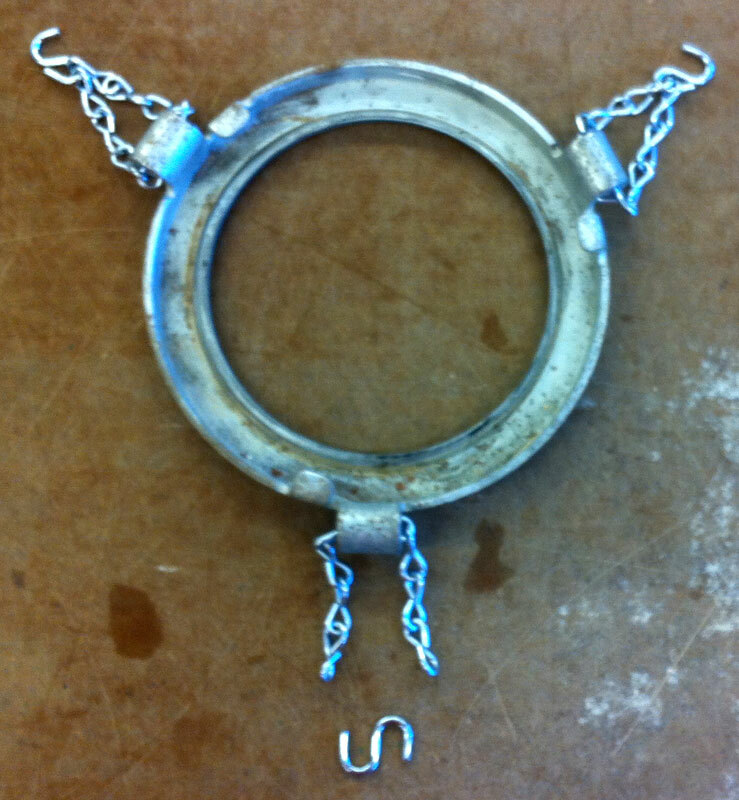 With longer pieces of chain added for hanging. Finished butterfly feeder hanging from a beam above my deck. At right is how the finished butterfly feeder turned out. 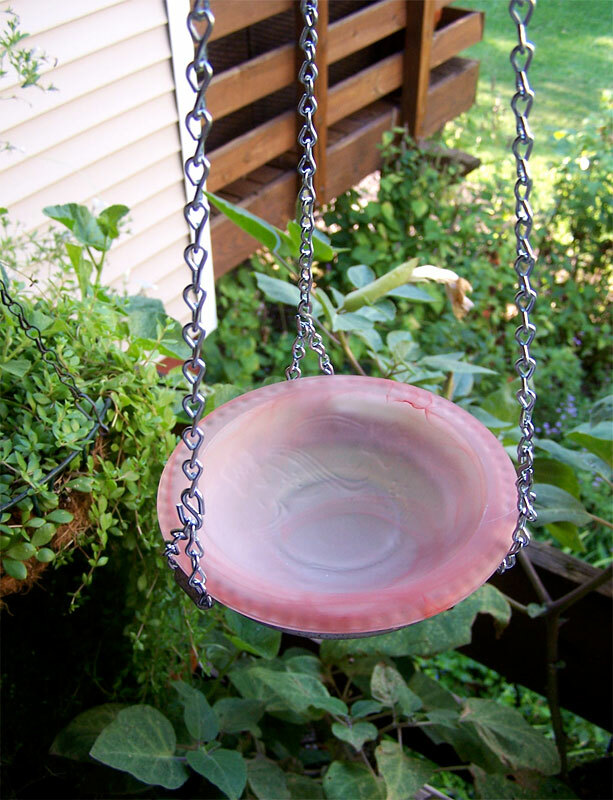 What food should one put in a butterfly feeder? If you have visited the Sophia M. Sachs Butterfly House in Faust Park you have probably seen plate feeders stocked with fruit in the conservatory. Butterflies like to sip juices from the fruit and according to Sally Roth, author of one of my all-time favorite gardening books “Attracting Butterflies & Hummingbirds to Your Backyard”, they like it even better if it’s fermenting. That’s a good way to get use out of fruit that has gone bad. 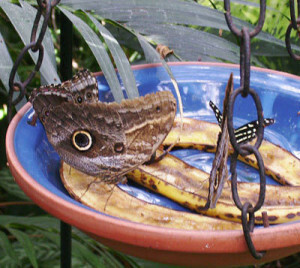 Butterflies feeding on overripe bananas at the Sophia M. Sachs Butterfly House. Fungi – if you don’t like to leave the fungal growths that pop up spontaneously in the garden in place, you could add them to the butterfly feeder – the butterflies will appreciate it! It is evident that some foods that butterflies like are not attractive to humans. What you choose to add to the feeder may depend on your tolerance for odors or the possibility of attracting other wildlife. If you do not want other insects such as wasps and bees to access the food, you can make a cover from window screen or wire mesh that will allow the butterflies to poke their long proboscises through the screen into the food while excluding other insects. I’m writing this toward the end of summer so there is not a whole lot of time this year for butterflies to make use of my new feeder. When the weather gets too cold for butterflies I’ll hang the feeder from a ceiling hook near a window in my home and use it as a plant hanger! In the fall I can always use extra space for plants when it’s time to bring them inside – they have a way of multiplying in the warm months, don’t they? I’ll put the feeder back out in late winter, perhaps even before flowers are in bloom, so that early-emerging butterflies can get something to eat if they need it.